Fireworks displays in your area. Spring has sprung, bring on the fireworks displays! Soon the sun won’t be setting until 9pm, the smell of neighborhood BBQ grills will be a daily occurrence and summertime activities will be in full swing. The first big holiday to celebrate with fireworks is only 7 weeks away, Memorial Day. 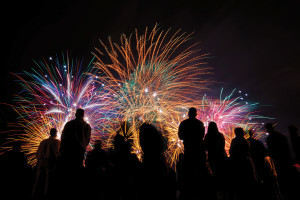 Cities and towns across the USA kick off this summer spectacular with fireworks displays for all to enjoy, but how to find them? Click the link and enter your zip code to find information about firework displays close to you or your destination for summer holidays. This entry was posted in Fireworks Display, Holiday Fireworks and tagged 4th of July, Fireworks Display, Holiday. Bookmark the permalink.